1 of 6 Heat oven to 400 degrees F. Fit one piecrust into 9-inch pie plate. Set aside. 2 of 6 Place second piecrust on a cutting board. Cut into 1-inch-wide strips. 3 of 6 In a large bowl, combine apples, cherries, 2/3 cup of the sugar, apple juice concentrate, cornstarch, lemon juice, cinnamon, nutmeg and salt. 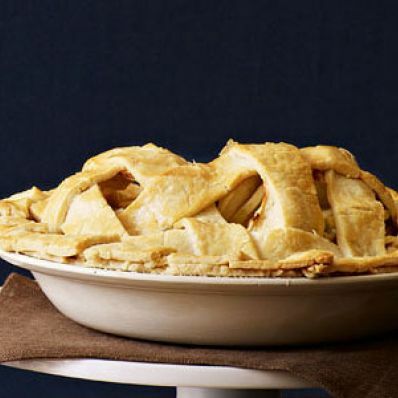 Pour apple filling into crust in pie plate. 4 of 6 With pastry strips, weave a lattice over top of pie. Crimp ends of strips under edge of crust. 5 of 6 Brush egg mixture over lattice. Sprinkle with remaining tablespoon sugar. 6 of 6 Bake at 400 degrees for 50 to 60 minutes, until apples are tender. Cover edge with foil after 25 minutes if browning too quickly. Cool on wire rack.